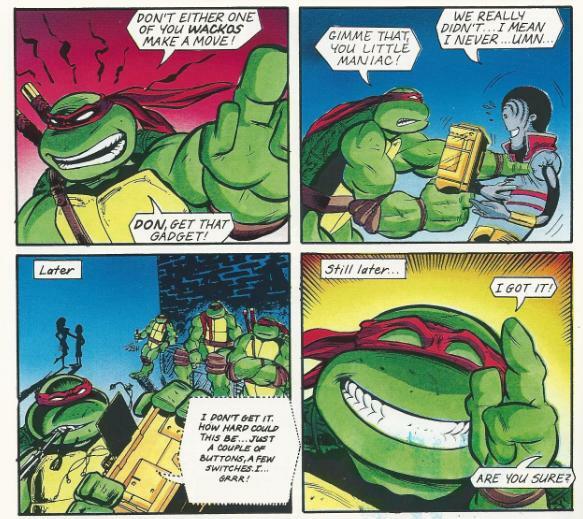 As the Ninja Turtles square off against the samurai trio, Leo tells his brothers not to attack unless provoked. The samurai make the first move and charge with their swords drawn. The Turtles attempt to hold the line, but the samurai prove more skilled than the monsters they’d just faced. Thinking that the Turtles are “demons” and that Henry is the “wizard” who summoned them, the lead samurai breaks past Don and makes a move to hack Henry to pieces. Panicking, Henry messes with the buttons on his gauntlet and sends the samurai back just in the nick of time. Leonardo has had *enough* and tells Don to take the gauntlet from Henry and figure it out by himself. Henry and Betti are forced to stand far away while Don labors over the device. After some time, he figures out that it’s programmed in binary and punches in the return coordinates. Henry and Betti apologize for all the trouble and return to their dimension and time. With time now “unfrozen”, the Turtles put their disguises back on and head out for their long-delayed dinner. Returning to his lab, Henry apologizes to Betti for all the trouble. Betti, on the other hand, thanks him for the best date of her life and gives him a big kiss. *This story is continued from Teenage Mutant NinjaTurtles Attack!!! Part 3. So what happened to that struthiomimus that didn’t get sent back to the past? Leo points out that “the little one” got away. I guess somewhere in the Mirage TMNT universe, a dinosaur is roaming the hills of Massachusetts, stealing eggs and getting confused for a featherless ostrich. The samurai battle is disappointingly condensed in this chapter of the story, only really lasting 6 panels. 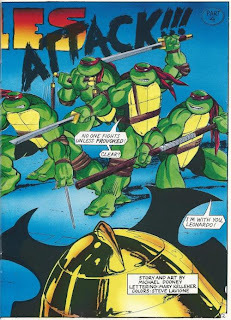 As a result, the concluding installment of “Teenage Mutant Ninja Turtles Attack!! !” is less exciting than what came before. 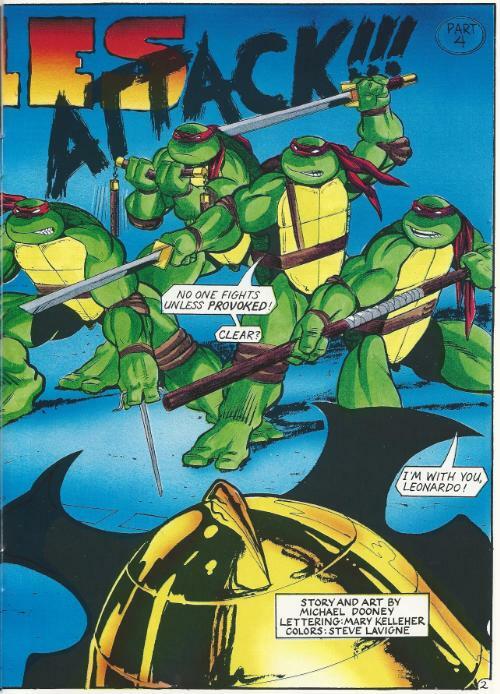 I kind of wonder if this was originally conceived as another standalone issue of the “guest era” of TMNT Vol. 1, but got shuffled off to Turtle Soup once Vol. 1 reestablished an ongoing continuity. Had it been a full-length issue, we might have gotten longer fights and maybe some stronger characterization for Henry and Betti. As a serial, “Turtles Attack” has to sacrifice story for a pair of impressive two-page splashes at the beginning of each chapter. And with each chapter only being 6 pages, you lose 2 of them to the title and credits alone. On the other hand, those splash pages were very pretty and it’s hard to knock getting lavish Michael Dooney art on any occasion. While the resolution is pretty rushed (Don just figures it out because he’s Donatello and he can master time and space manipulation equipment when the plot calls for it), I did get a good laugh out of Leo losing his temper. He basically puts Henry and Betti in a timeout and the Turtles stand between them and the gauntlet to prevent any further mishaps. Anyway, “Turtles Attack!! !” is one of the better reasons to pick up the second volume of Turtle Soup. As the ongoing serial within the series, I wouldn’t call it “thrilling” reading, but the story provides opportunity for Dooney to draw a variety of cool enemies to pit the Turtles against, and that’s hardly a bad thing.